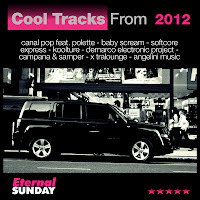 As a gift to our fans and friends we’re giving away a FREE PROMO COMPILATION called Eternal Sunday: Cool Tracks From 2012. It contains, of course, a sampler of the music we released in 2012. The compilation features 8 tracks (mp3, 192 kps) and will be available for FREE download until January 31, 2013. It also contains a .pdf virtual booklet, an original cover image and a readme file. You can download the FREE PROMO COMPILATION here (click on this sentence, opens new promo window).